Connector your ipods/ MP3 player/ cell phone to your kenwood car radio with kenwood CD Changer input using this cable. Plug the din 13pin connector into the back of your kenwood radio, and another ends 2rca, plug in the devices, like your ipods/ MP3 player/ cell phone, etc. and enjoy the sound with excellent quality. 1. Play your music through your kenwood car head unit. 2. Hear your music in much better quality then other iPOD connections. 3. Easily installed in your car. 4. 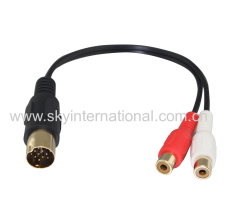 RCA female connector on one end, and din 13pin male connector on another end. Work on aftermarket pioneer stereo, some factory stereo may not work.